Folio 1r, first folio of manuscript. Regla de la Sagrada Orden de Penitencia. 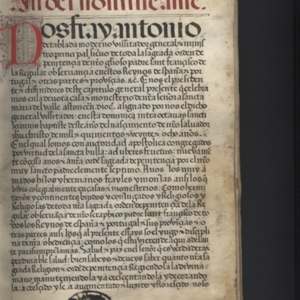 First page of manuscript, demonstrating Iberian Gothic Rotunda bookhand in black ink (Spanish), rubricated (red) Latin text, and a decorated capital. 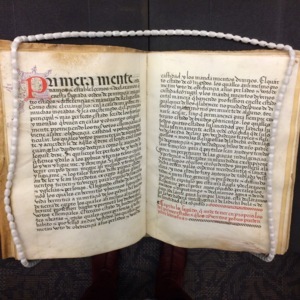 Manuscript pages demonstrating decorated capital. Regla de la Sagrada Orden de Penitencia. First chapter of Regla de la Sagrada Orden de Penitencia. 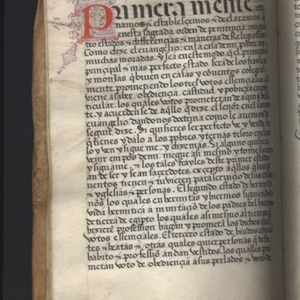 Text in Spanish, in legible Iberian Gothic Rotunda bookhand, as well as an elaborate rubricated capital P, decorated in brown and purple ink. First chapter of the Rule. Regla de la Sagrada Orden de Penitencia. 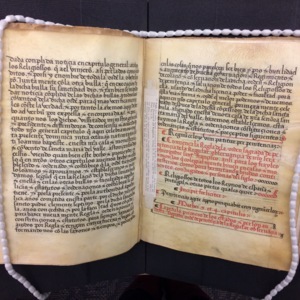 Text in red and black ink, with rubricated (red) border lines.